GOES-16 (formerly known as GOES-R) is a joint NASA-NOAA geostationary satellite used for for monitoring smoke, flooding impacts, burn scars, volcanic ash, and weather over the Americas. As important as this data is, finding and using it effectively can be difficult and often requires significant investment on the part of the end user. With experience in both Earth Science data tools, as well as video streaming platforms, we were poised to provide the perfect solutions to this challenge. Searching for and processing GOES-16 satellite data can be difficult and time-consuming for a typical users. 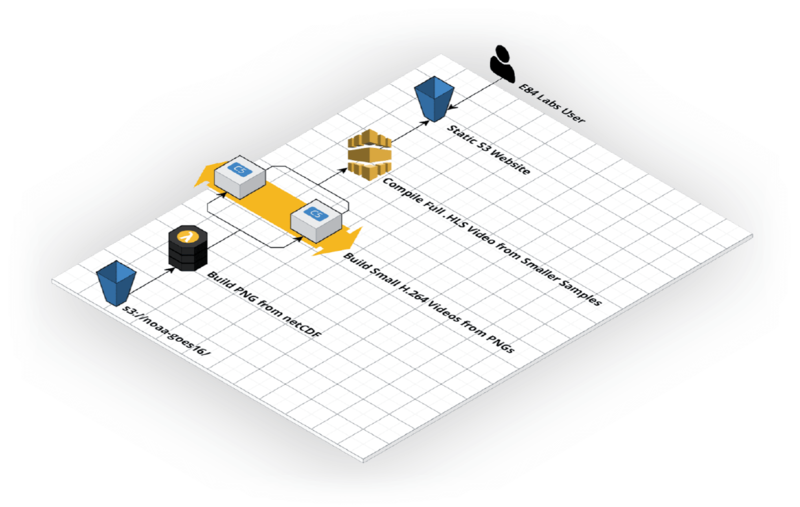 Harness AWS and provide a navigable video that allows for search and discovery in a familiar video player interface. Element 84’s R&D team set out to try and make this dataset easier to use by converting and streaming the GOES-16 NetCDF files as a navigable video so users could search and discover data in a familiar interface on everything from a cell phone to a laptop. This interactive navigation allows you to easily identify time ranges of interest — often associated with real world events like hurricanes — and stage an analysis-ready, cloud-friendly subset of the GOES-16 archive along with the relevant metadata and video clip necessary to take advantage of the data. The best part is that it all scales down to $0 when not being used.